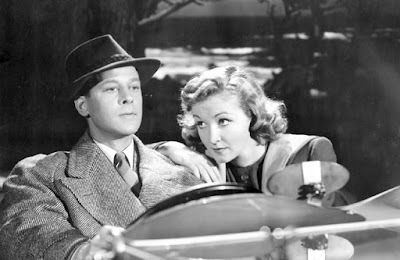 After a breakup, single gal Julia Ross (Nina Foch) looks for a new job. 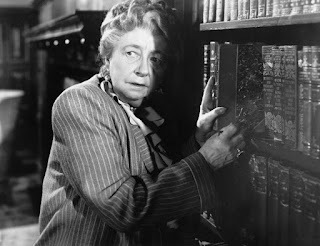 She finds one as a secretary to a seemingly lovely old woman, Mrs. Hughes (May Whitty). After being hired on the spot and given a cash advance on her pay, she is informed that she will have to live with her employers. She agrees but remains skeptical. Suddenly, having no memory of how she arrived, she is in a hilltop mansion, and in another woman’s monogrammed robe, no less. Everyone insists she is Mrs. Marion Hughes, Mrs. Hughes’ son’s wife. Miles out of town and away from anyone who knows her, Julia Ross must stay strong and alert to outsmart and escape her creepy captors so that she can go back to her normal life! Based on the novel The Woman in Red by Anthony Gilbert, and considered a film noir, every shot of this 65-minute movie is captivating. 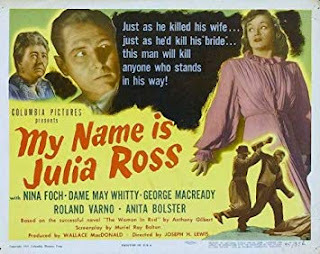 While My Name is Julia Ross employs the visual tropes of the genre, like the use of shadows and creative use of contrast with black and white film, the narrative is told from the female protagonist’s point of view, eschewing the typical femme fatale plot that had become commonplace at this point and perhaps an expected cliché. Suspenseful to the very end, this movie does not insult the audience’s intelligence by making the protagonist an idiot. She is easy to root for because she is a smart cookie. Nothing gets past Julia, and though she does struggle, she retains strength throughout the entire ordeal. Her captors, Ralph Hughes (George Macready) and his mom aren’t slouches themselves, so the tension is taut! There is a tacked on heteronormative ending that if not executed as charmingly as it is, could leave a bad taste in some non-traditionalist’s mouths and sort of leaves the movie with a broken ideology. It’s one of those endings that lovers of the film will surely disregard because the climax preceding is so satisfying. For the fashion-lovers and those with a sharp eye for detail, this new Blu-ray transfer allows the audience to enjoy the delicately ornate fashions of post WW2 ‘40s fashions in a new way. Every stitch of Nina Foch’s wardrobe shines and the texture in every tweed jacket looks like one could reach out and touch it! A B-list movie, My Name is Julia Ross received favorable reviews from contemporary critics, paving the way for director Joseph H. Lewis to break out of making B-movies, and lead him to making other noir films, including the one he became known for, Gun Crazy. Nina Foch was also liked by critics and audiences with this considered her breakout role. She went on to star in another of Lewis’ noirs, The Undercover Man (1950). My Name is Julia Ross was also remade in 1987 as Dead of Winter staring Mary Steenbergen and Roddy McDowall. Special features on this release aren’t as plentiful as some of the other Arrow Blu-ray releases. The theatrical trailer is included as well as a short discussion with Nora Fiore (film blogger, The Nitrate Diva) that discusses the historical context during the time this film was made. She talks about the expectations of women post-WW2, and how this influenced the narrative of the movie, perhaps being very relatable to female audience members of the era. There is also an audio commentary with author and film scholar, Alan K. Rode, where he discusses the making of the film and other historical facts about the actors and crew who worked on the movie.